City country fingers (3), Green streets (51), Network of paths and cars (52). Cities have become "concrete jungles'. They lack large spaces, green spaces, and routes where people can take exercise in natural surroundings. Too few cities offer the blend of "country' and "town' benefits that Ebenezer Howard praised in Garden Cities of Tomorrow. In most large cities, the public parks were planned at a time when most people earned their living by physical labour and did not own private gardens. 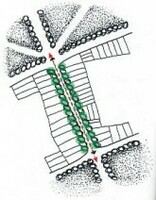 In older urban areas, convert lightly trafficked streets, railway lines and other linear features into linear parks, so that they interlink smaller and older parks (Figure 7). A parkway system will provide for the active recreational pursuits that the modern sedentary worker requires. When new urban areas are being planned, establish a network of parkways before setting aside land for roads or buildings. It is difficult to retrofit urban areas with parkways. Ensure that parkways are accessible and that, wherever possible, they link pedestrian origins to destinations (e.g. homes to stations, shops and schools). Accessible green (60), Small public squares (61).